How Cute! How Physically Impossible! After taking my daughter around trick-or-treating, I settled in and relaxed by playing a bit of Minecraft. 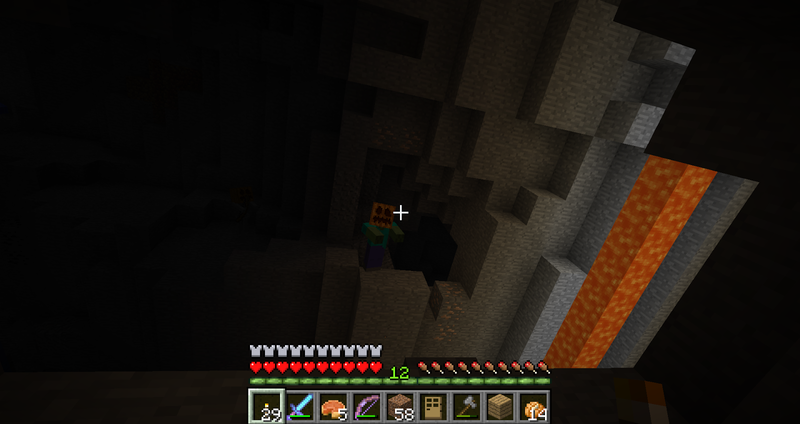 I went out to check my mob spawners and was met with a frightening, yet festive sight. Apparently, zombies, zombie pigmen, skeletons, and wither skeletons have a chance of spawning with pumpkins equipped as head armor if you play on Halloween. 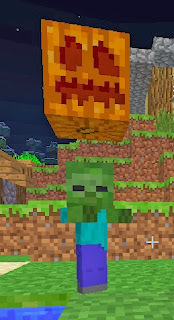 Baby zombies and baby zombie pigmen will also have a chance to spawn with pumpkins equipped, but they won't wear them correctly; the pumpkins will float over their heads. Ever since Minecraft version 1.4, the game automatically checks the date on your computer, and, if it's Halloween, all naturally generated mobs will wear pumpkins. It's also worth noting that, when a zombie wears head armor, they are immune to sunlight, so this Minecraft Halloween easter egg is a bit more insidious than you'd imagine, especially with the baby zombie mobs. Those little buggers were overpowered to begin with. Adding sunlight immunity to them makes them that much tougher. However, the pumpkin does add a 1 block height to the hit zone of the baby zombies and baby zombie pigmen, so they will be easier to hit. Keep in mind, though, that while the pumpkin adds height to the hit zone, it does not prevent baby zombies and baby zombie pigmen from entering spaces with only a 1 block high entry way. Trick Or Treat! How Do You Like My Jack Skellington Costume?